The TOURTECH VM50 dynamic microphone is a practical and durable microphone, designed in the UK. Includes an XLR Cable and features a 5-Year .. The TOURTECH VM50 dynamic microphone is a practical and durable microphone, designed in the UK. Includes an XLR Cable and features a 5-Year Warranty for the perfect peace of mind. A wide frequency response, superb off-axis rejection and rugged zinc alloy housing make the VM50 the ultimate take-anywhere mic for vocals, guitar cabs and percussion. The VM50 is a very versatile microphone that handles high SPL with no distortion. The result is a crystal-clear, detailed response that is tailor made for both live sound and recording. Pound for Pound, we've not seen another dynamic mic at this price point that offers the same level of feedback rejection, build quality and performance! With its 50Hz – 12kHz frequency response along with its unidirectional polar pattern, the VM50 makes for a great vocal microphone. The internal pop shield also goes a long way to ensuring great, studio-quality vocal capture. Thanks to its high SPL capability though, you can use the TOURTECH VM50 dynamic mic for a multitude of instrument applications too. The capsule within the VM50 has been designed to withstand extreme SPL levels without distortion so it’s ideal for miking up guitar cabs and even drums. Developed for professional use by performers and sound engineers alike, TOURTECH have made the VM50 dynamic mic extremely durable. The chassis is made with a metal alloy and is scratch resistant so it’ll withstand all the rigours of life on the road. The steel grille is also exceptionally strong in order to protect the capsule from drops and other bumps. What's more, the VM50 dynamic mic even comes to you with an XLR to XLR cable so it's ready to use right away. 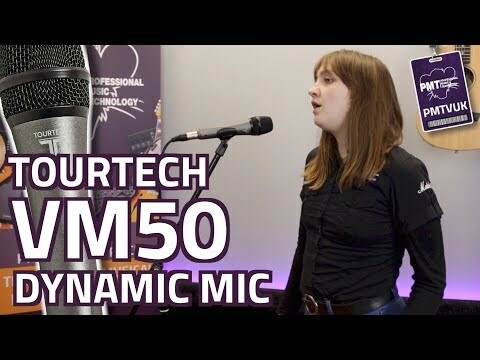 Buy the TOURTECH VM50 dynamic microphone from Professional Music Technology now if you need a great performing vocal mic or instrument mic at a very attractive price.